For the third year in a row The Cooper Union has been ranked as the top college of its region by the U.S. News and World Report Best Colleges annual guide. The 2014 rankings were released Tuesday. Additionally the Albert Nerken School of Engineering ranked seventh in the U.S. among undergraduate engineering programs that did not offer a doctorate. It also ranked among the top ten undergraduate programs for specific engineering degrees including Electrical (#3), Mechanical (#5) and Civil (#4). 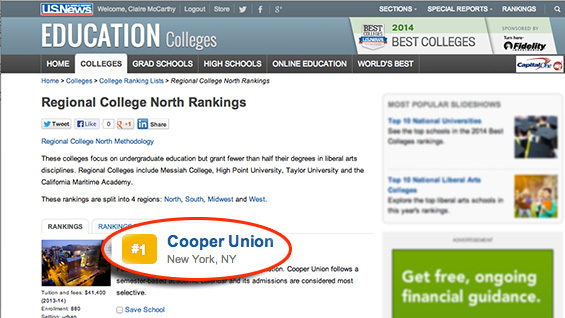 The Cooper Union was also ranked as the top regional "Best Value" school. "It is very gratifying but certainly not surprising that U.S. News ranks The Cooper Union as the top college of its kind in the northeastern U.S." President Bharucha said. "Our highly selective, intensely smart student body, our remarkable faculty and the rigorous work being done makes certain of that. The U.S. News Best Colleges rankings offer objective proof of what we already know to be true: that The Cooper Union offers the best undergraduate experience of its kind." Mitchell Lipton, Dean of Admissions and Records and Registrar seconded the president, saying, "I am once again thrilled to see Cooper Union ranked #1 regional college of the North." The Cooper Union ranked first in the list of northeast U.S. schools that focus on undergraduate education but grant fewer than half their degrees in liberal arts disciplines. According to the U.S. News FAQ, the ranking results from data gathered during the spring and summer of 2013 relating to "academic excellence," including peer assessment, retention and graduation of students, student selectivity and other factors. Rankings for the School of Engineering and its programs are based on peer judgments of deans and senior faculty who rated programs they are familiar with in two surveys conducted in the spring of 2013. "We expect to highlight our North regional ranking along with our U.S. News engineering program rankings to all prospective students both in print, in person and on-line," Dean Lipton says of his recruiting plans. But he also encourages students to look deeper than the rankings. "While our high rankings may expose The Cooper Union to someone unfamiliar with our unique programs, applicants should also do their homework to ensure our college meets their academic and personal needs. I recommend students learn more about the schools they discover from reading the U.S. News rankings. This should include visiting campuses and talking to students, alumni and faculty at the colleges that interest them."